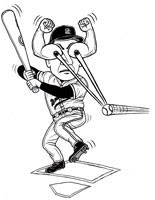 Jason Kendall had laser eye surgery over the off-season and credits this to an improved batting eye. "I feel like I'm 18 again," Kendall said of his vision improvement. "I'm picking up the rotation on the ball like I used to." Good news. Hopefully that will translate to a few more base runners for Rickie Weeks to knock around. But that’s not the point of this post. I’ve often pondered that if steroids are so detrimental to the game because they give players an unfair advantage, why don’t things like LASIK surgery fall into the same category? I’ve posed this question to a number of people and they react like I’m nuts. “Of course steroids are worse. I mean, they’re steroids. You know. They’re not natural.” Oh yeah? Getting a corrective lens soldered onto your eyeball with a laser beam IS natural? It has been demonstrated to us by the likes of Ken Caminiti and Lyle Alzado that taking steroids is dangerous to your health. It’s certainly not something we want our kids doing, lest they grown up to be mutants or worse yet predecease us. But didn’t at least a few poor souls go blind while doctors perfected LASIK? Isn’t there still some risk involved with that too? What if doctors were able to develop drugs that would improve your strength and stamina with no side effects whatsoever? Would those be ok? What if it wasn’t done with chemicals? What if implanting a series of electrodes in your biceps and lungs did the same thing? Would it be ok for players to have that surgery? Tommy John surgery has been perfected to the point that a young pitcher may wish to have it before his elbow hurts. Do we allow that? How bad must his elbow hurt before we give him the ok? These are all things that sports are going to someday need to address. There are many things that players do to their bodies to enhance their performance – everything from eating right and getting to bed at a decent hour to hiring a personal trainer who is allowed to dictate their body chemistry down to the last electron. We are ok if a player takes ergocalciferol (vitamin D), but feel it a scandal if he takes androstenedione. We’re uneasy about a player having elective Tommy John surgery, but have no trouble at all if he has elective LASIK surgery. It’s perfectly fine to get a cortisone shot in your knee, but you’re a cheater if you get an HGH shot in your other -nee. Why? Where exactly is the line? I'm just asking.